These cabinets provide safe, portable storage for small spaces. 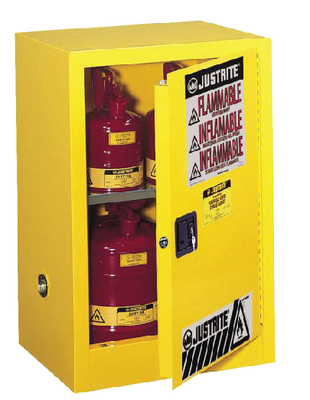 Whether storing smaller quantities of flammable liquids at a work station or expanding existing storage capacities, these cabinets make it possible to keep flammables safe even when space is at a minimum. Enjoy quick access to frequently used liquids without compromising safety standards. Supplied with one adjustable shelf, they have the same great features as larger cabinets, and the portable size allows for flexible positioning within the workspace. Ordering information: This cabinet features a continuous piano hinge door, a three–point closure with keyed lock, a self-latching door mechanism, and reflective hazard warning labels.